The second improvement is a new thread mode: MAIN_ORDERED. It is a variation of the default MAIN thread mode and also ensures event delivery in the main thread. The difference is when an event is posted in the main thread: with MAIN it will pass on the event to subscribers immediately in a synchronous fashion. MAIN_ORDERED will only enqueue the event in the call to post(...) for later delivery to subscribers. This gives event processing a stricter and more consistent order (thus the name MAIN_ORDERED). For example if you post another event in an event handler with MAIN thread mode, the second event handler will finish before the first one (because it is called synchronously – compare it to a method call). With MAIN_ORDERED, the first event handler would finish, and then the second one will be invoked at a later point in time (as soon as the main thread has capacity). We are considering making MAIN_ORDERED the default in a future version of EventBus. Because MAIN and MAIN_ORDERED behave slightly different, there may be some cases where this also may change an app’s behavior. It’s a trade off in every case: MAIN is faster when events are posted on the main thread and MAIN_ORDERED offers more consistent and predictable event delivery. Let us know what you think about it. 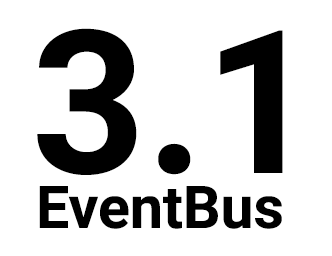 One more thing: we would love to get some feedback on EventBus and how we can further improve it. Our feedback form takes only a minute. Thank you! Posted in Release and tagged EventBus, main thread, Multithreading, plain Java, thread mode. Great stuff guys. Plain Java support and MAIN_ORDERED are the two best things you could have done to improve EventBus. Thank you! When will we see a MAIN_ORDERED for postSticky()? This feature is SOO needed. Currently, the limit of 1 sticky event requires creative workarounds.